iQiyi, seen as the „Netflix of China,“ missed on both the top and bottom lines. Shares tumbled 12% following the company’s third-quarter results. iQiyi added a net of 13.5 million subscribers in the third quarter. 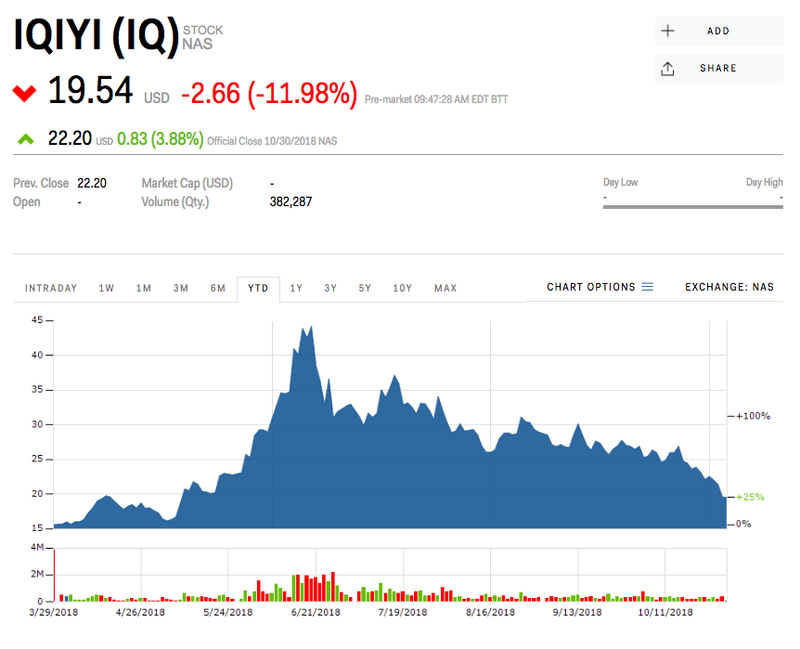 iQiyi, widely seen as the „Netflix of China,“ tumbled as much as 12% Wednesday after the company reported third-quarter sales and profits that fell short of Wall Street estimates. The Chinese video-streaming giant on Tuesday announced a loss of $4.30 a share, missing the $2.80 loss that was expected by Wall Street analysts, according to Bloomberg data. The company generated $6.91 billion in sales, missing the $6.97 billion that was anticipated. Meanwhile, the company added a net of 13.5 million subscribers in the third quarter. By the end of September, iQiyi had a total of 80.7 million subscribing members, over 98% of whom were paying. That’s up 89% versus a year ago. „Our library of premium content continued to excel, driving robust growth in subscriber number and membership revenue.,“ CEO Yu Gong said in a press release. For the fourth quarter, the iQiyi expects total revenue to be between RMB6.48 billion ($943.5 million) and RMB6.75 billion (US$982.8 million), but said its outlook is subject to substantial uncertainty. iQiyi’s third-quarter subscriber net adds surpassed Jefferies analysts‘ expectation. Chan reiterated her „buy“ rating, but lowered her price target to $30 from $33 — 50% above where shares were currently trading. iQiyi shares are down 60% from their June record high, but are up 9% from where they went public in March.